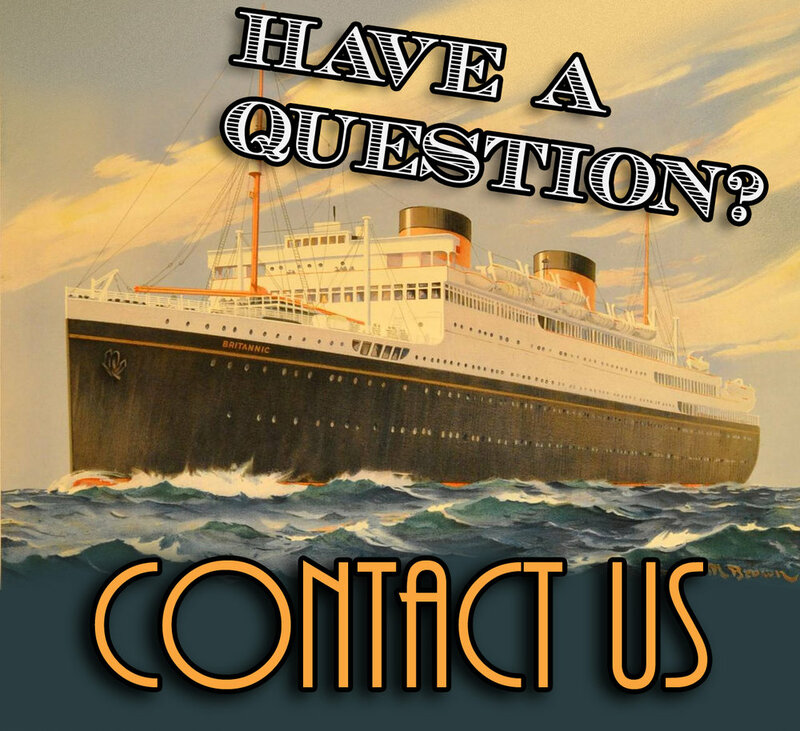 In this month’s Spotlight we feature a fascinating ship which sailed for an incredible 59 years under a dizzying number of guises; as a German freighter and repair-vessel, a Canadian cargo-passenger ship, an Italian immigrant liner and finally as a Greek - and then Cypriot - cruise-ship. 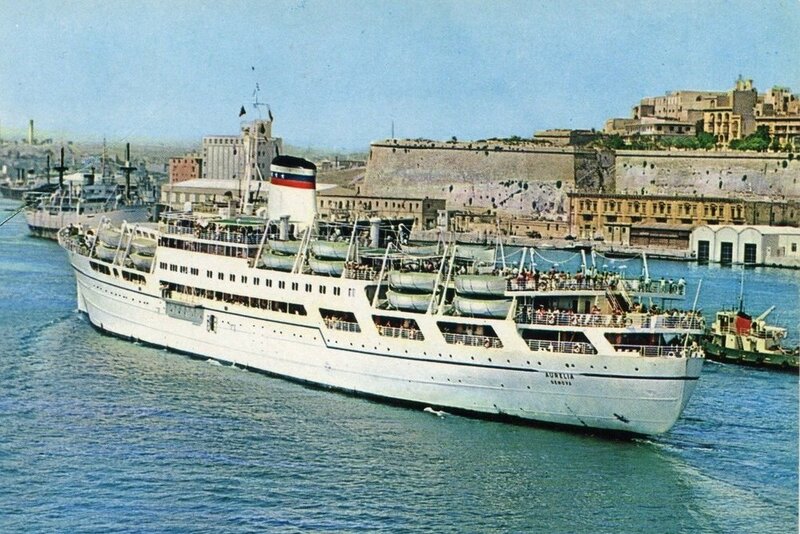 Perhaps she is best remembered as ‘Aurelia’, the chic Italian liner which endeared herself to thousands. Few of her passengers would ever have believed that the stylish ship whose decks they so casually strolled had served decades earlier as a repair-vessel to some of Nazi Germany’s most feared warships. Germany’s Hamburg-Amerika Line - or HAPAG - was a serious contender in the world’s sea lanes for much of the 19th and early 20th centuries, launching scores of famous liners and earning a reputation for safety and reliability. HAPAG suffered poorly at the end of the First World War when three of its latest transatlantic Liners - ‘Imperator’, ‘Vaterland’ and ‘Bismarck’ - were turned over to Cunard, United States and White Star Lines respectively as part of reparations. Weathering the stormy post-war Weimar era and in constant competition with Norddeutscher Lloyd, HAPAG focused on creating a fleet of combined passenger-cargo vessels to service ports around the globe. One of these ships was Huascaran, a diesel-powered 6,900-ton freighter launched by famed shipyard Blohm und Voss in 1938 and intended to operate the Hamburg - South America service. She and her sister Osorno bore slightly clumsy names - Huscaran referring to a Peruvian mountain and Osorno after a Chilean city. Only capable of mustering a paltry 16-knot (30km/h) top speed, Huascaran relied on carrying a sizeable amount of cargo for profit and boasted 39 luxurious first-class cabins. In April 1939 Huascaran sailed for Genoa, Italy on a Maiden Voyage without incident. Returning to Hamburg, the spartan vessel moored off Spain and took on board Germany’s corpulent Air Force commander Hermann Goering who had just completed an inspection of the ‘Condor Legion’- a unit which had infamously fought during the Spanish Civil War. With the outbreak of war in September 1939 HAPAG was once again faced with the prospect of seeing its fleet devastated by hostilities. Huascaran was requisitioned by the Kriegsmarine (German Navy) while her sister, Osorno, had been surprised by the declaration of war off South America and sailed for safety far way in Japanese waters. Huascaran was used initially as a military transport before conversion to repair-ship duties based out of Norway. Her war would be relatively quiet save for two incidents in 1940 when the humble ship was able to provide critical repairs to the two German battleships Scharnhorst and Gneisenau. Again she was called upon in 1942 to provide emergency assistance to the heavy cruiser Prinz Eugen - most famous for being the ship which escorted Bismarck in her fateful engagement against the British warships Hood and Prince of Wales. With Germany’s defeat, Huascaran sailed in convoy and officially surrendered to the Allies in May of 1945. Although she had survived, Osorno had not been so lucky. After a series of daring blockade-running voyages between France and Japan she had been hunted by Allied warships and aircraft without fruition. It was only in 1944 that she struck a submerged wreck while entering the Gironde, France, and had to be beached. Her wreck was destroyed in August of that year by the German military. Just as they had feared, HAPAG again found themselves on the losing side of a massively destructive war and their surviving fleet was decimated in the name of reparations. 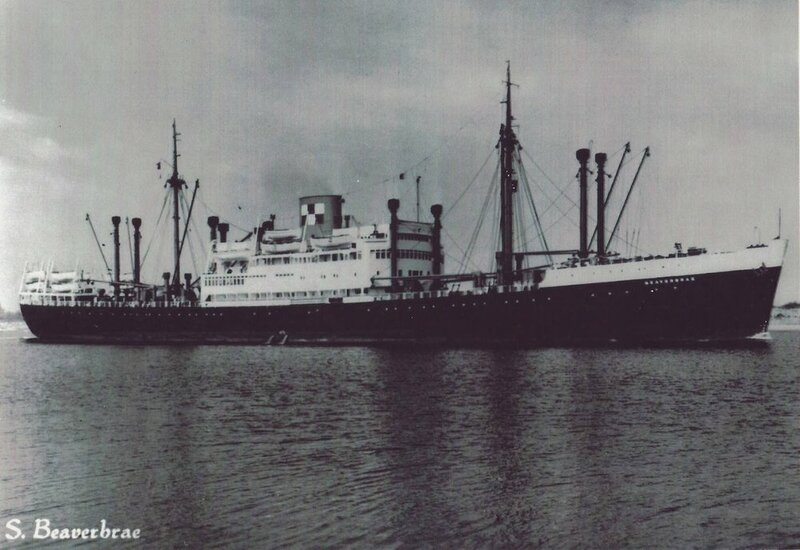 Like Imperator, Vaterland and Bismarck before her, Huascaran was awarded to an Allied shipping line; Canadian-based ‘North American Transports INC.’, before being sold on to the Canadian-Pacific Steamship Co. in 1947. Canadian-Pacific suffered terribly during the War, having lost an entire class of five passenger-cargo sister ships - amongst others. Huascaran was re-built as a passenger-cargo ship once more, and although her exterior appearance remained virtually untouched she was fitted with 79 staterooms and a dormitory featuring some 700 double-decker beds. Finally having been renamed ‘Beaverbrae’ and displacing some 9,034 GRT (gross registered tons), the ship began to operate as an immigrant vessel carrying displaced persons from Germany to Canada. On return trips her dormitory, empty of passengers, could easily be converted to carry freight cargo alone. In this way Beaverbrae returned to the purely utilitarian role for which she had initially been intended to serve by her original and unfortunate operator HAPAG. After six years of work with the Canadian-Pacific Line, Beaverbrae had completed some 52 trips and helped re-settle 33,259 displaced European nationals. In 1954 the ageing freighter was retired from service and sold on to a small Italian line hoping to capitalise on the lucrative immigrant market to that unimaginably-distant land of opportunity; Australia. Post-war Europe saw an enormous emigration boom as millions sought steady employment and greatly improved living conditions; by the mid-1950s, many European cities and towns still lay in ruins. Greeks and Italians especially hoped to brave the three-week voyage to Australia en-masse to re-establish themselves and their families. As such there emerged a new business-model for Greek and Italian shipping Lines; to purchase ageing British or American ships, re-furnish and re-paint them at minimal cost and operate a direct route to Australia. Greek-based 'Chandris Lines’ first bought Union Castle’s ‘Bloemfontein Castle’ and, with minimal effort, converted her to the well-loved ‘Patris’. This set the pattern and very soon Chandris’ fleet was comprised of a rag-tag assortment of formerly-British and American ships. In November 1954, Beaverbrae was sold to Italy’s Cia. Genovese do Armamento - otherwise known as COGEDAR. 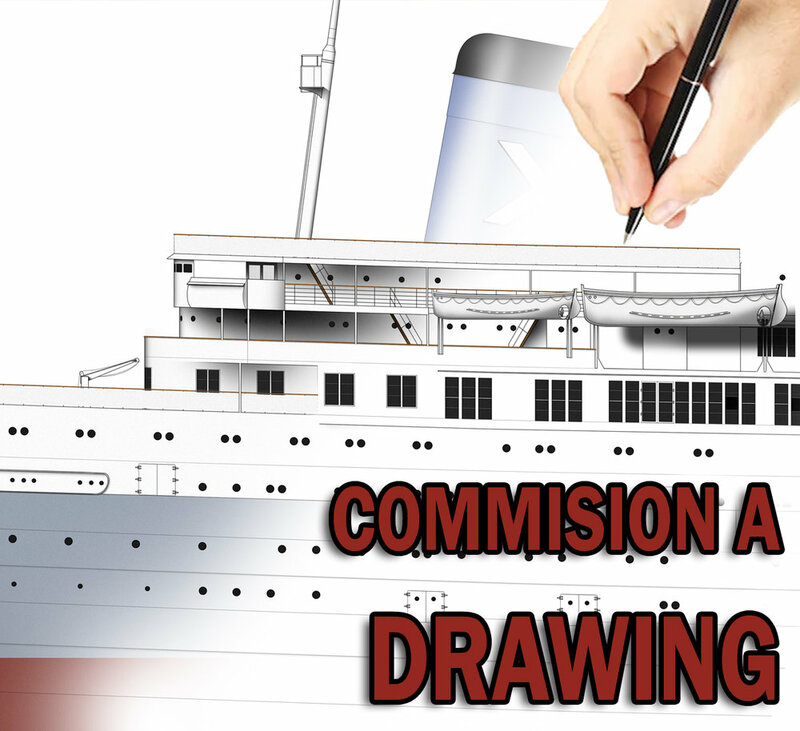 They had grand plans for the little liner and her conversion would be no rush job. Steaming to Monfalcone near Trieste, the vessel was re-built from the superstructure-up over the course of five months. Once complete, the former-Beaverbrae was hardly recognisable. Her superstructure, once blocky and utilitarian, was now elegantly lengthened to accommodate far more passenger facilities and brand new cabins. Her promenades were enclosed, funnel modernised and her bow lengthened by 6.7 meters with a sleek rake. In a brilliant coat of white paint the ‘new’ vessel - Aurelia - steamed out of harbour for her second ‘Maiden Voyage’ in May 1955. Her external appearance had changed dramatically and her interior changed even more so. Beaverbrae’s spartan cabins and dormitories had been replaced with modernised staterooms of two, four, six or eight beds. She had a capacity of just over 1,100 passengers and carried more lifeboats accordingly. Most impressively of all, the entire ship was now fully air-conditioned and an open-air Lido Pool had been installed on the ‘Sports Deck’ aft. Aurelia wasn’t a hastily-converted freighter; she was a stylish new vessel and a highly attractive option for immigrants seeking to start new lives in Australia and New Zealand. It is testament to COGEDAR’s engineers and designers that Aurelia would go on to sail under this configuration - with very few changes - for another 42 years. Aurelia in profile - seen here after her second re-fit in 1958 when she was further modernised. Image by Liner Designs and Illustration. Learn more here. Now displacing over 10,000-ton, Aurelia proved to be a popular Liner and operated alongside running-mates ‘Flaminia’ and ‘Flavia’. Her route from Europe was via Naples, Messina, Malta, Piraeus, Port Said, Aden and finally Australia where her red and blue-banded funnel became a familiar sight. So successful was COGEDAR’s conversion and so strong was their faith in their vessel that in 1958 it was decided Aurelia should be further modernised. Brand new MAN diesel engines were installed and her superstructure was lengthened to include a sun-deck and children’s pool. As planned, the little Aurelia worked the Europe-Australia line out of Bremerhaven or Rotterdam as well as a number of cruises ‘to nowhere’ and three circumnavigations of the globe. She was even used as a transatlantic liner; in the Summer of 1960, the United States Council on Student Travel chartered the vessel for a round-trip from Bremen to New York. 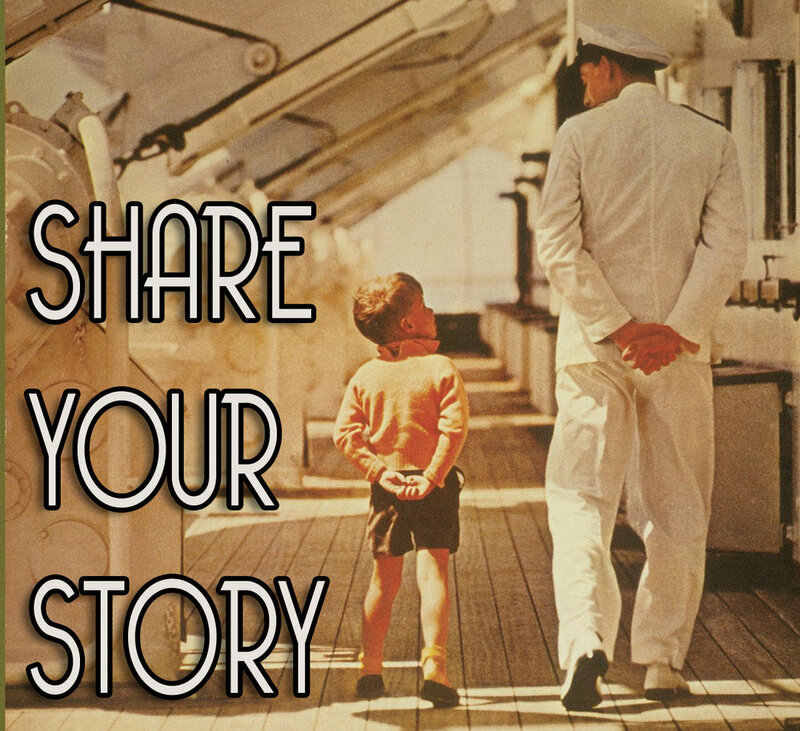 The journey was a success and this peculiar role became a staple of Aurelia’s Summer schedule until 1969 - she would sail a total of 34 between New York and England. This veritable ‘Swiss Army-Knife’ of a ship is probably best remembered for her role as an immigrant vessel which she carried out with perfect adeptness. It is remarkable that a relatively small ship such as Aurelia should brave the wild and unpredictable Indian Ocean so often as to boast a distinguished role in carrying a whole generation of European migrants to Australia. Over the course of her career with COGEDAR the able little ship ferried untold thousands for new and exciting prospects, depositing families at Freemantle, Sydney or Melbourne. Even today mention of her name is enough to conjure happy memories of three leisurely weeks at sea imagining, with some trepidation, a life that seemed so foreign and unattainable after so many years of hardship. Aurelia - the little ship that had a big impact on Australia! So concludes our look at the first half of Aurelia’s life. Incredibly, this was not the end of the road; she would go on to sail under the Chandris lines flag as ‘Romanza’ and, eventually, as ‘Romantica’ for New Ambassador Leisure Cruises and Paradise Cruises before succumbing to a dramatic end. That is, however, a story for our next instalment of ‘In the Spotlight’!